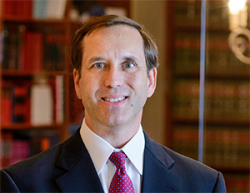 Mr. Gilmer was educated at the University of Alabama and has practiced law in Mobile since his admission to the bar. He has handled litigation skillfully for over 30 years and brings to the table a breadth of experience litigating, arbitrating, and negotiating complex matters of all types. He enjoys solving problems and is dedicated to building strong working relationships with his clients. Throughout his career, Mr. Gilmer has represented insurance entities regarding claims, sales practices, and other types of complex litigation. He has achieved significant wins in the insurance and commercial litigation arenas, including defeating class actions in Alabama and other jurisdictions. He has also helped to establish important precedent regarding insurance and arbitration issues and is experienced in all aspects of civil litigation, including employment and products liability litigation. Mr. Gilmer is a member of the Board of Trustees of Ashland Place United Methodist Church, and for many years he has been actively involved with the Leukemia and Lymphoma Society, including service on the Board of Trustees for the Alabama/Gulf Coast Chapter. Mr. Gilmer is an avid runner, a sports enthusiast, and a music lover. He and his wife, Elisabeth, have three sons and a rescue dog.